For your #WednesdayWrite, I have a meme for you, on the right side of the post. I know that you are writing proposals and reports (instead of essays), but the idea probably still applies. The difference between Facebook (or Instagram or any other social media tool) and an essay is audience and purpose. With social media, you’re trying to connect with a friend, another student, or a family member. You probably have very particular people in mind. With your writing for classes, that may not be the case. So here’s your #WednesdayWrite challenge (and I hope you will have some fun with this): Find another meme or cartoon that has to do with writing or communicating, whether in school, in the workplace, or with family and friends. Share the link to your image, and explain what underlying writing principles it relies on. For the meme here, I explained that it relates to audience and purpose. Make sure it is appropriate for the class. It needs to be clean and avoid any kind of discrimination. Don’t repeat an image someone else has posted. As I can, I will add the images so that they display on the post. I think I linked that correctly…. This is a mildly funny meme again sticking to the theme of recognizing who your audience and what the intended purpose of your writing is, in this case its contextual to memes and is too literal as a joke of course. It speaks to writing appropriately; memes are supposed to be short and clever. It is not a place to write a novel and that more often than not takes away its purpose’s effectiveness (to get a laugh in most cases). This can be applied to other forms of writing even in the professional world and is something to think about when trying to communicate effectively in whatever form of writing you are working on. This was a fun one thanks! This meme takes us back to our discussions at the beginning of the semester about professional emails. While it doesn’t explicitly mention emails, that’s what I associated it with when I first saw it. The underlying principle it’s discussing is the common practice (at least for some people like me) to overly use exclamation points in emails, or even other written communications, for the purpose of sounding happier/more excited/less mad. When writing emails, I often don’t want my recipient to think I am uninterested about the information we’re discussing or angry with them. Therefore, I fall into an “overly-enthusiastic trap”, as the author of “A Friendly Person’s Guide to Using Exclamation Marks Correctly! And Incorrectly!” describes it. I picked this meme because I feel we all run into similar problems during the editing process. When we are constructing our draft, we have a line of thinking but upon revisitation, these thoughts are much less clear as initially thought. That’s why I appreciate getting at least a second look-over by someone other than the author. It allows the work to be criticised by an unbiased party and will ultimately help the work and author in the end. This meme made me think of what we have recently discussed with regards to the introductions of proposals, as well as what the overall purpose of the class is. Your reader is not a mind reader and therefore you need to be able to effectively summarize and communicate your ideas to get the point across. You should not beat around the bush when trying to ask for something or share your thoughts, because there will be more opportunity for miscommunication. It’s a simple meme but still pretty relevant! I think this meme relates back to one of the earlier conversations we had about emails and the importance of knowing what you’re writing. I think when kids are in grade school they should be taught the difference between you’re and your, as well as to, too, and two. These are simple mistakes that make a world of difference. If you are sending a professional email that is very well written, but you misspell one of the words listed above, I feel like the person will not take you seriously because it’s a simple difference that people pay attention to. I think this meme is very important at showing how punctuation can make a huge difference. If someone forgets one simple comma, the meaning of the sentence can complete change. This meme is similar to what Mariel posted in regards that grammar really does make a difference. Therefore, the lesson learned from the meme is to read what you write carefully and use correct punctuation, or the meaning you are trying to get across might not be what people actually read. Hopefully the link to the meme works, I’m not sure if I did it right. I thought that the meme was funny because I think I have gotten out of the habit from high school of doing a prewriting outline. This has definitely impacted the quality of my first drafts because I have not gotten all of my thoughts and ideas together before beginning to write. I’ve definitely realized the need for more planning in this course, since I haven’t really had to write anything in the past few years other than lab reports. This meme just reminded me that the preparation, research, and outline for the genre analysis report is extremely important and will help improve the quality of my report. This meme is in response to the one you shared about us, so this is likewise for you as an English teacher receiving our work. 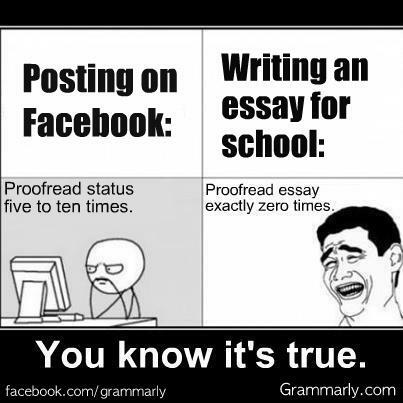 It resembles yours that we don’t proofread anything before turning an essay or report in. I hope you enjoy it! I find this meme hilarious for two reason. First off, we have all been in a situation where we are writing a paper and we are trying to meet a certain length requirement, we then start to write words that come to mind that might not make a lot of sense, but we think that they do at the time. I know I have been writing a paper early in the morning and I will use words that seem to make sense, but upon further inspection make no sense. 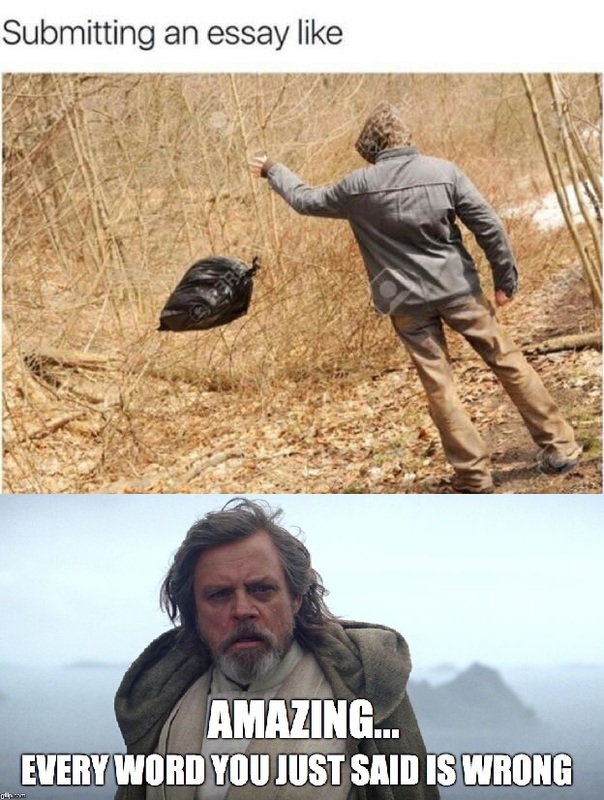 The second reason I like this meme is because I am a huge fan of the show that the meme came from. I found this meme funny but interesting and educative. Often times students focus on writing long papers to impress the reader without focusing on the audience needs. We usually end up deviating from the facts we have to provide because we have to find a way to put a bunch of ideas that will make the paper longer. Despite the essay’s length, it has to meet the need it is intended for. It is better to have a shorter paper with interesting facts that engage the audience than to a long paper that does not necessarily engage the audience. I found this meme to be particularly amusing based on the #FridayFact post (I usually end up reading the posts in opposite order than they were posted, whoops!). This meme relates to the fact that when writing, you don’t need to follow the rules. Grammar and punctuation are necessary for a legible piece, but the overly stringent requirements of many assignments tend to dissuade what could end up being great writing. Yes, direction for assignments is a good thing, but this meme does well in pointing out how teachers often go overboard. 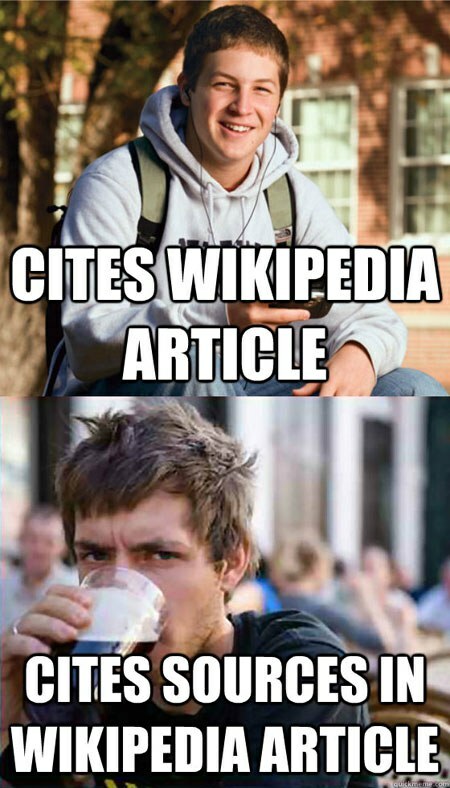 This meme I think relates to many of the students nowadays including me who feels Wikipedia is one of the easiest place to get information about anything nowadays. When it showed the picture of a person citing sources provided by Wiki instead of citing the page as a sleek and smart guy it is actually pretty accurate. This is because I remember that one of my professors said that Wikipedia itself as a page has many flaws but it is one of the best provider for outside resources with the links given in the end so its actually better to use those resources instead. Another one relating to grammar and spelling. It physically pains me when I read through a popular article or post on Facebook and see mistakes like these. In fact, I’ve even seen simple mistakes like these in professional writing. It is a constant reminder that there is no shame in checking on a definition to make sure that I am using the correct word or looking up a phrase to find its meaning.